Configure error handling for the PizzaOrderingBot bot. Navigate to the PizzaOrderingBot bot. Choose Editor. and then choose Error Handling. 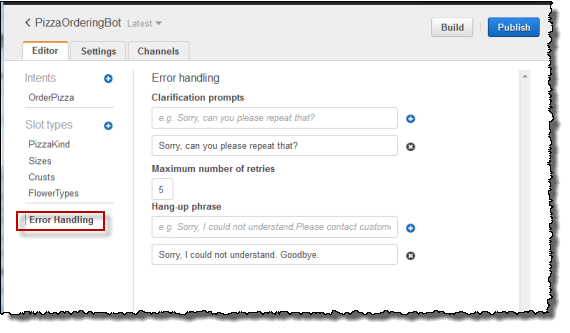 Use the Editor tab to configure bot error handling. Information you provide in Clarification Prompts maps to the bot's clarificationPrompt configuration. Information that you provide in the Hang-up phrase maps to the bot's abortStatement configuration. If the service can't determine the user's intent after a set number of consecutive requests, Amazon Lex returns a response with this message.